On our Facebook page we learned of a Good Samaritan who was trying to help a stray dog in Owen, Wisconsin. For two months she had appealed to local authorities, to no avail. In desperation, she turned to the Retrievers. As her job required driving between local communities, Tammy had frequently seen the dog in a field next to Hwy 29. Neighbors estimated that the dog, which she called “Owen,” had been in the area for up to two years. There was no photo—he would not allow anyone close enough to get decent shot. Neighbors described him as a setter or retriever mix. Although that part of Wisconsin is outside of our normal operations area, I offered to take the case because I have personal connections to the town. I arrived early afternoon on a Saturday, set up the Missy Trap to trigger manually by cutting power to an electromagnet, then waited in my car a short distance away. But Owen never showed. 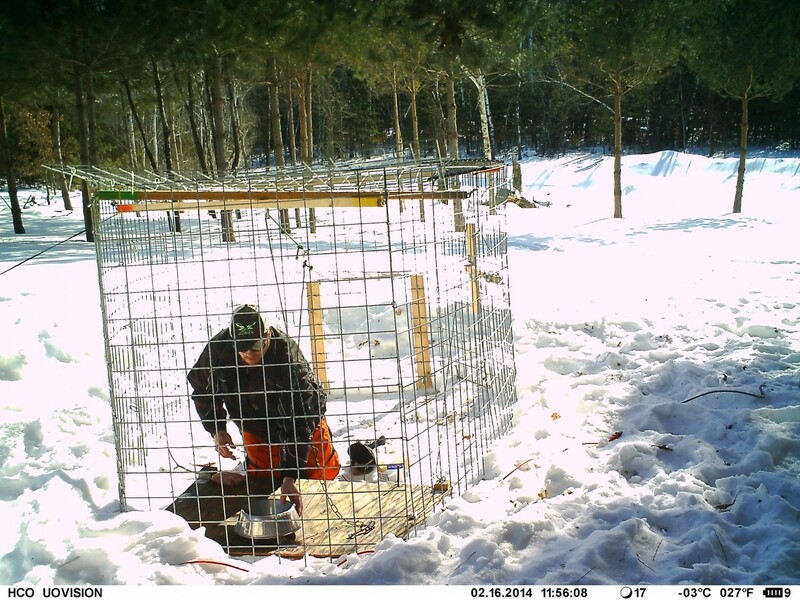 At 10:30 p.m., I reluctantly locked the trap gate open, turned on the cellular trail cam, instructed Tammy to stock the trap nightly with high-value food, then made the two-and-a-half-hour drive back to the Twin Cities. For two days, we received no photos from the camera and assumed that it had malfunctioned. But then we discovered that our hosting service’s spam filter had intercepted the shots, and suddenly 80 timestamped images poured into our email boxes. 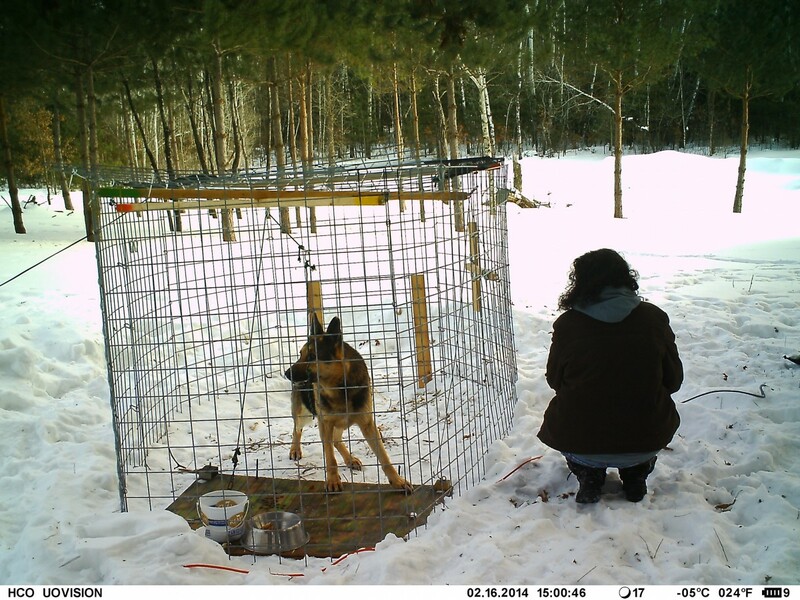 Monitoring her activities by trail cam for a week enabled us to predict when she would visit the trap. The following Friday, I returned to Owen, this time with a colleague—M.J. Brookes—our newly developed photoelectric sensor system, and a catchpole specially designed and constructed by teammate Jen Eidbo. 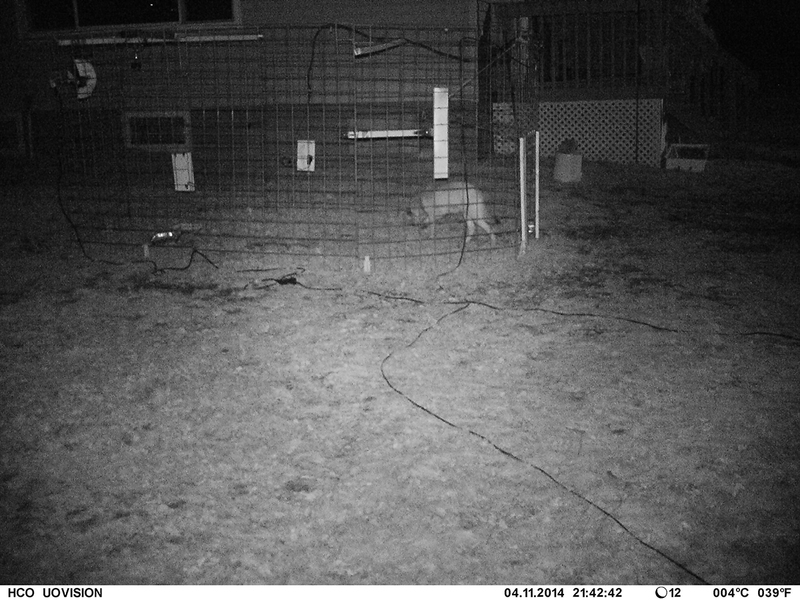 The trail cam images had shown that a neighbor’s cat often visited the trap, so we set the sensor at a height too high for it to inadvertently break the beam and cause the gate to drop. 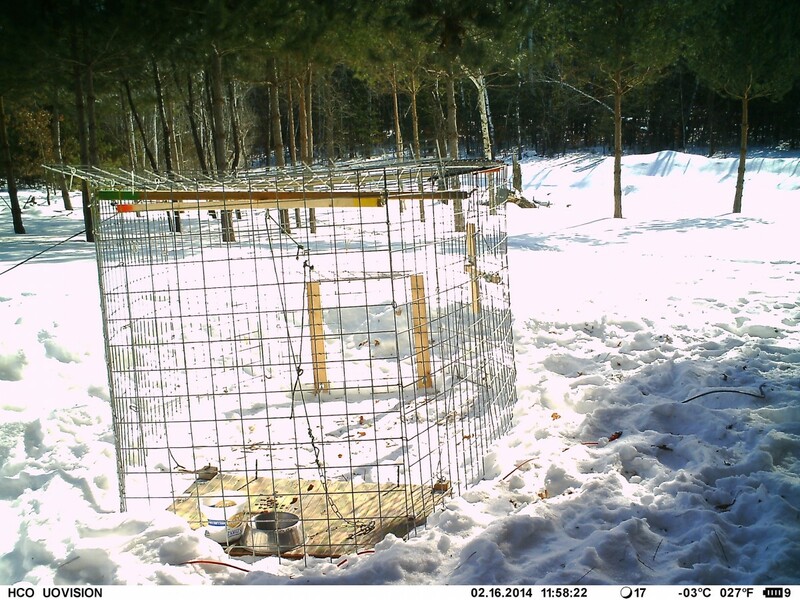 And because we suspected Rowan had avoided the trap when we were present the previous weekend, we waited in a car parked 100 yards away as we monitored the trap via a video surveillance system comprised of Skype and two smartphones. Rowan came by right on time at 9:45 p.m., but shocked us by skittering beneath the sensor beam. In less than 30 seconds, she ate much of her food and exited the trap without triggering the gate. Thankfully, because we’d observed her patterns, we knew she would be back. We lowered the sensor and waited again. 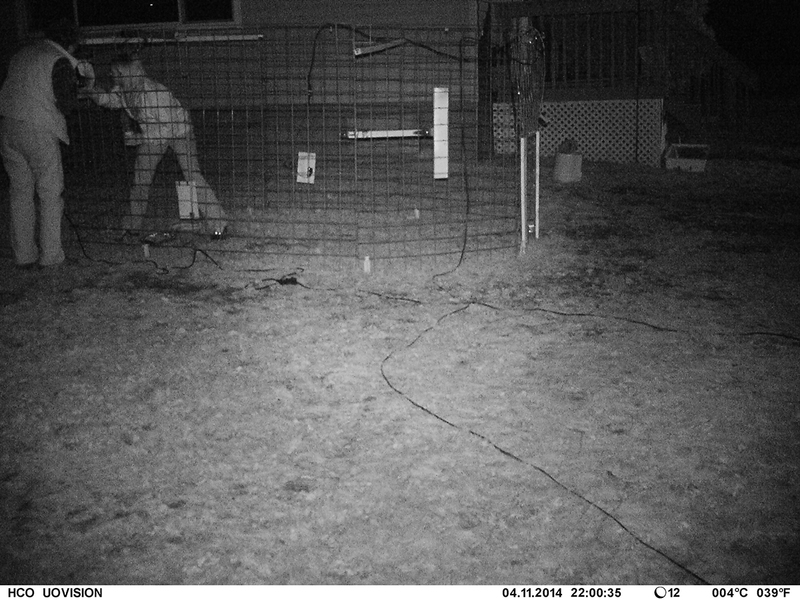 Rowan returned at 11:20 p.m., and this time walked through the beam and triggered the gate. As we approached the trap, she started climbing up the meshed panels and was halfway out when I was able to get the catchpole on her. She jumped down to the ground and went into a full-scale panic, writhing and growling and snarling and gnawing on the lead on the catchpole. Luckily, we were able to get her into a crate before she could chew completely through and escape. Once she was in the crate and the tension was off the lead, she quickly calmed down. Rowan turned out to be a much smaller dog than we had expected—likely a beagle/shepherd mix. Her later vet visit revealed her weight at only 33 pounds. No wonder she was able to duck under the beam! The vet estimated her age at 1 1/2 years. Though she was not spayed, she shows no evidence of having had a litter. She is heartworm-free, basically healthy, and not microchipped. Rowan’s return to a home environment has been more successful than anyone could have predicted. Tammy reports that within the first few days, she was playing with the family’s other dogs and even enjoyed being brushed and petted by Tammy and her husband. You can follow Rowan’s story on her Facebook page, Hope for Owen. 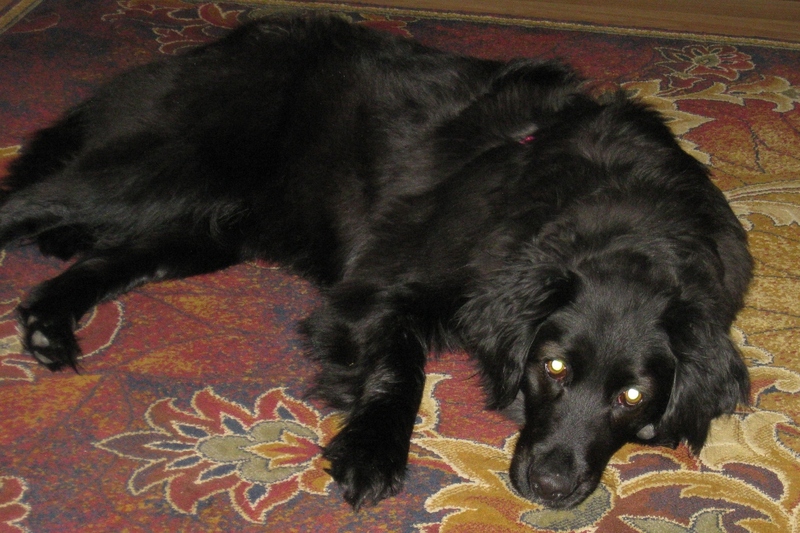 The Retrievers learned of Chloe through her lost dog posting in late Nov 2013. She escaped her harness while at Petsmart just after being adopted. 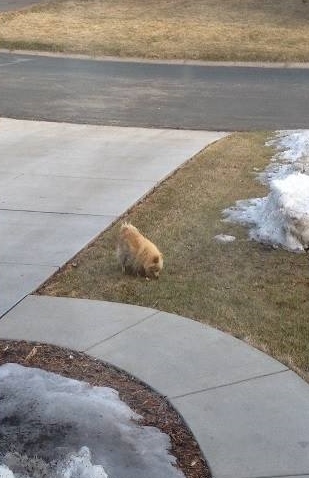 There were zero sightings of this Pomeranian and given the coldest winter in Minnesota history, the outlook on hope was slim. 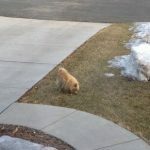 In April of 2014, The Retrievers heard from a Good Samaritan (GS) who had spotted a Pomeranian regularly in her neighborhood and visiting their home for food they were providing it. There were thoughts this could be Chloe from Nov, but could it really be after all this time? Given how small she was, could she have really survived the coldest winter in Minnesota history on her own? Only time would tell…. 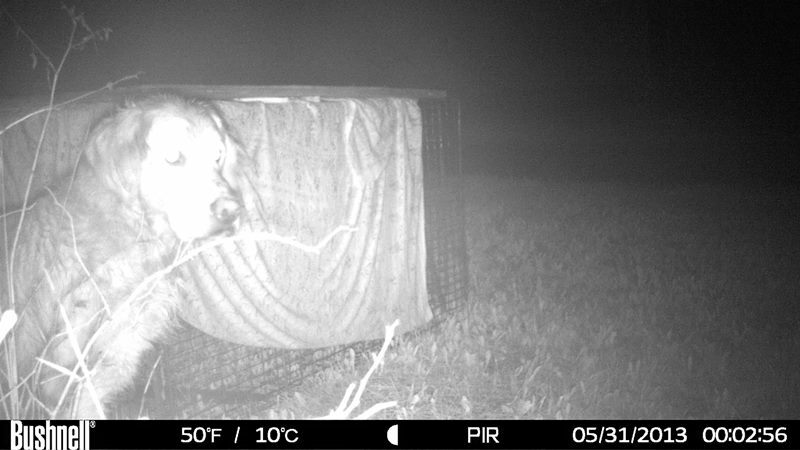 The Retrievers partnered with the GS to provide a wire crate to use as a trap and with their ingenuity they were able to outfit the trap with a rope that was run to their home, and two live cameras they would monitor from their home. 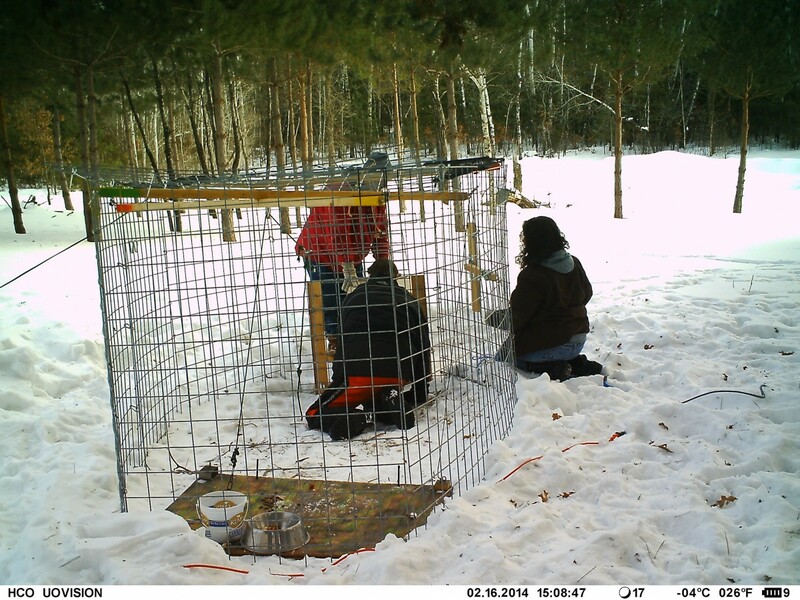 Then they waited….about 10 days after first sighting the Pomeranian and setting regular feeding stations, there she came and the GS was ready and watching the video feed from their cameras set up near the trap. 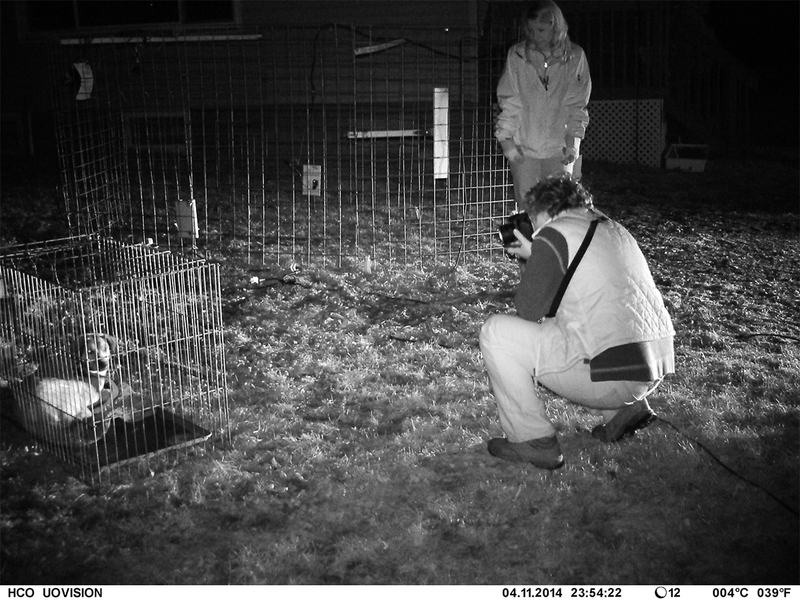 They used the cameras to make sure she was all the way into the trap before pulling the gate closed with the rope. They got her! After speaking with the owner and wondering of this really could be Chloe, it was determined that this precious little girl was indeed her and she had survived the winter. Pure resilience. the GS in April 2014. Huge kudos to the GS whose goodwill and determination got this brave little girl out of the cold and back to her loving home where she belonged! Minneapolis residents Josh and Ashley woke at 3 a.m. to their dog Casey barking, and when they looked out the window, the saw a dog outside their house. Possibly a bull terrier/Vizsla mix, the dog was there the next day, too, but ran when Josh tried to catch him. They placed a shelter–a cardboard box lined with a sleeping bag–in their front yard and started putting out food, and the dog seemed pleased to have both. Although Josh reached out to local rescues to help “Pete,” sadly none were able to come to his aid. However, we learned about Pete through our network of friends and rescue advocates, and Retriever Jen Eidbo went to the house to help. She found Pete lying in the box–shaking with fear–so she immediately sat to one side and asked Josh to bring her pieces of hotdog and a leash. Pete sniffed her hand with no issues. Jen fed him dog treats and slowly gained his trust. In time, he let her pet his neck, ears and muzzle. With every piece of hotdog, Jen moved the leash a little closer. 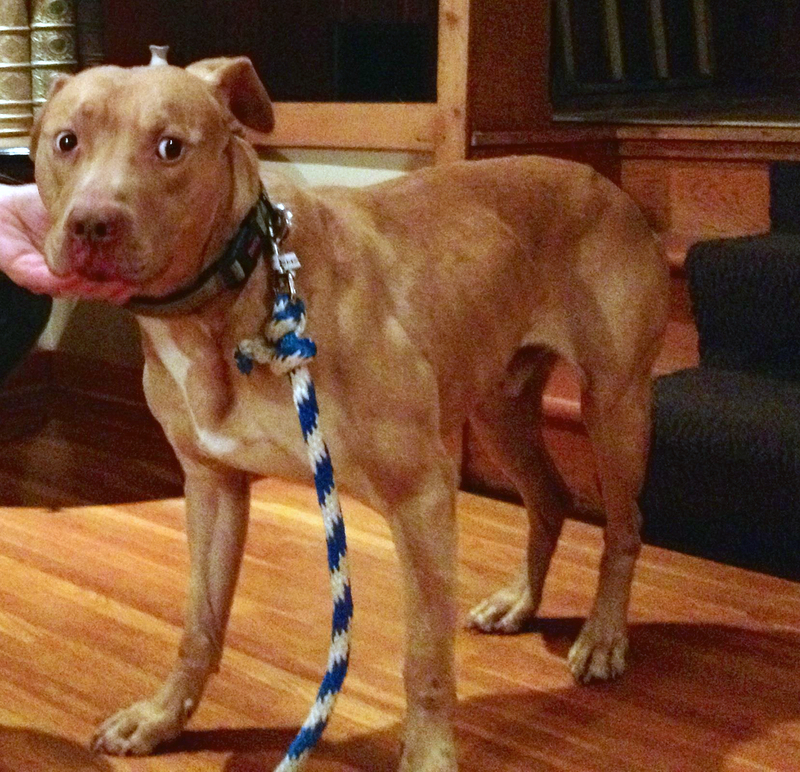 When she was finally able to get the leash around his neck, Pete was still shaking but did not attempt to bolt. They then opened the top of the box and petted Pete for a while, but he wouldn’t come out on his own. So Jen gently pulled the sleeping bag out from under him, causing him to slowly stand and walk out. With a little coaxing, Pete was led into the house and into a crate lined with the same bedding that had comforted him for the last couple of days. Josh and Ashley fostered Pete for several days until a rescue was found. He was transferred to 4 Luv of Dog for placement into a permanent home. 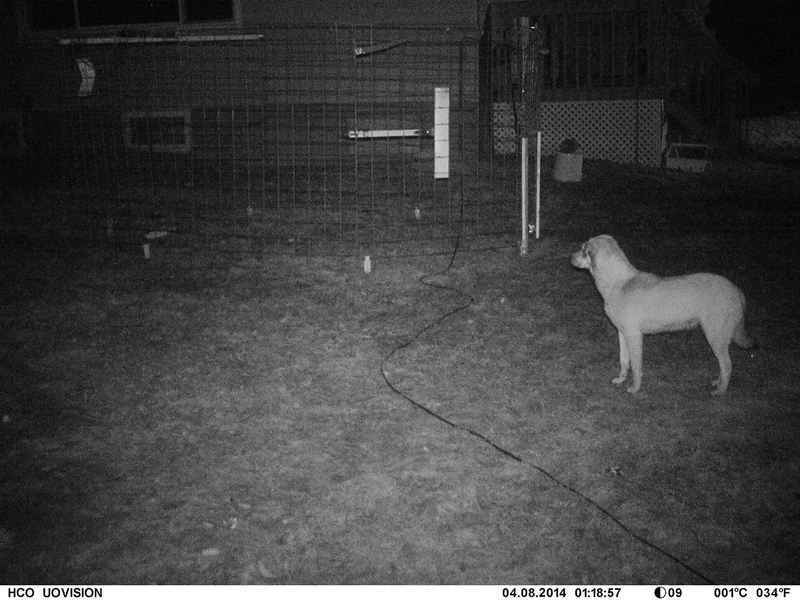 In March 2014, we learned about a stray Chesapeake Bay Retriever who had shown up in the North Branch, Minnesota, area the previous fall. Fed by several Good Samaritan families, the Chessie had survived on his own in a wooded area through the harsh winter of 2013-2014. This dog was seemingly friendly, but was not willing to let anyone get within 100 feet to try to help him. 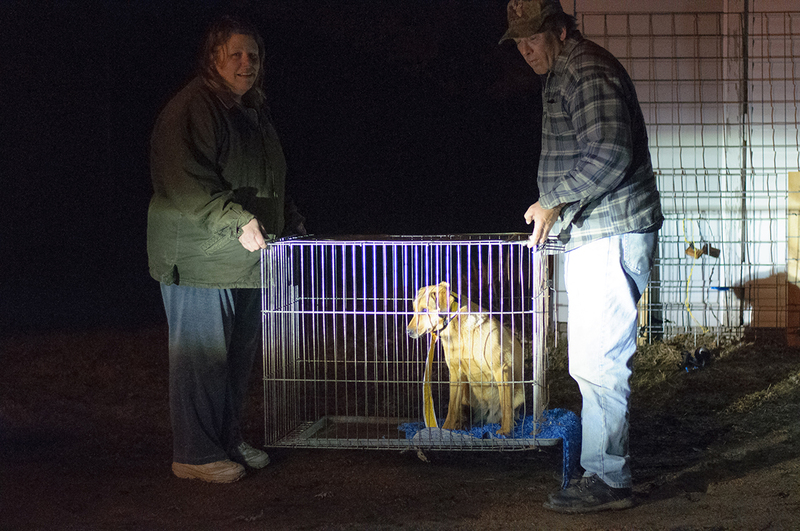 An action plan was put in place and the Retrievers team set out the Missy Trap to try to bring this survivor in from the cold. Because the families had done such a good job of getting the dog into a feeding routine, he was remaining in the general area and returning to the same two locations for food. 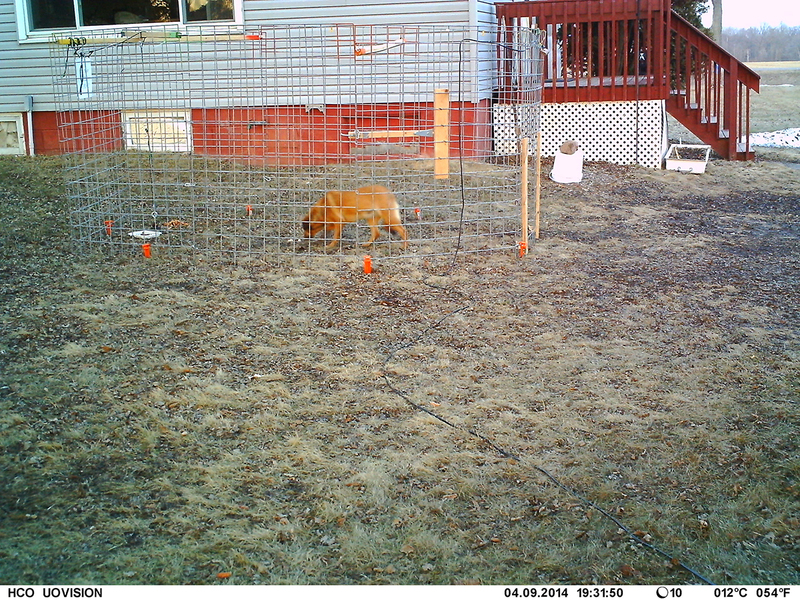 We set up the Missy Trap at 4 p.m. on a Saturday afternoon as the Chessie sat and watched from a distance. 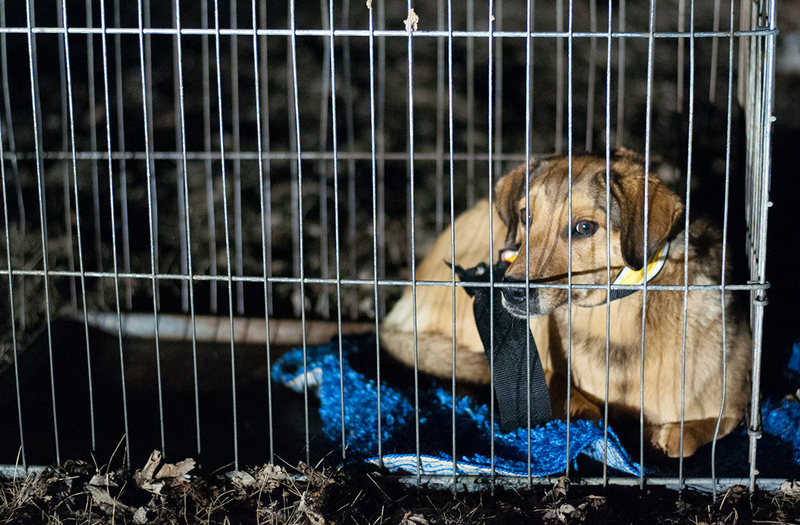 Initially, we’d planned to lock the gate open for the night to allow him to get comfortable with the trap. But since he was not scared away by our commotion, we decided to try to catch him that same day. For four hours, we observed him from inside a parked vehicle as he walked hesitantly around the trap, too skittish to enter. But eventually, the aroma of the tasty bait and treats inside overpowered his fear. Once he was far enough into the trap, we triggered the gate to close, and we had him. We named him Winter. He is as kind a dog you could ever meet, and he seemed to be relieved when we caught him. 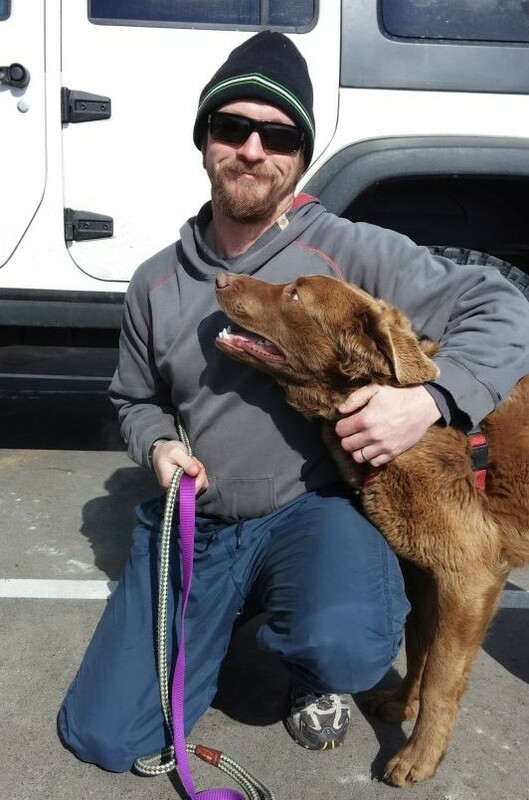 He spent his first night with one of the Retriever team members, and the following morning was transported to the Chesapeake Retriever Rescue of Wisconsin. He is doing very well in foster care and they have renamed him Yukon. It’s spring, and for many owners, that means it’s time for your dog’s annual checkup. While you’re there, be sure to have your vet verify that your dog’s microchip is still present and operating. Failures are rare, but sometimes microchips let us down. They stop working, or they migrate from the original implantation site, making it difficult to find when scanning. A yearly checkup of your dog’s microchip will help ensure that he’s prepared in case you two get separated. 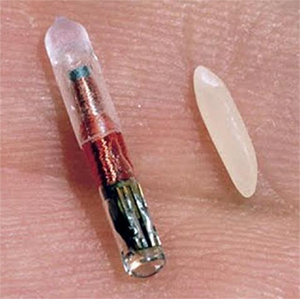 For everything you always wanted to know about microchips, see this article from the American Veterinary Medical association: Microchipping of Animals. 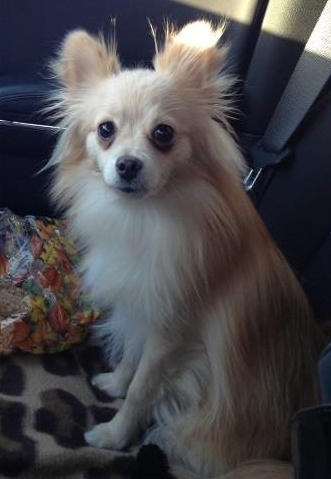 On December 8, 2013, Samuel slipped his collar shortly after arriving at a local rescue’s foster home. Numerous volunteers from the rescue mounted an aggressive search for the young German Shepherd, putting countless flyers into the hands of residents and businesses in the area and placing signs at many intersections. In late January, a Good Samaritan in the area noticed Samuel in his yard of his home. At first glance he thought Samuel was a coyote, but he quickly realized it was a German Shepherd. He and his wife recalled the signs they’d seen for Samuel, and they contacted his rescue. 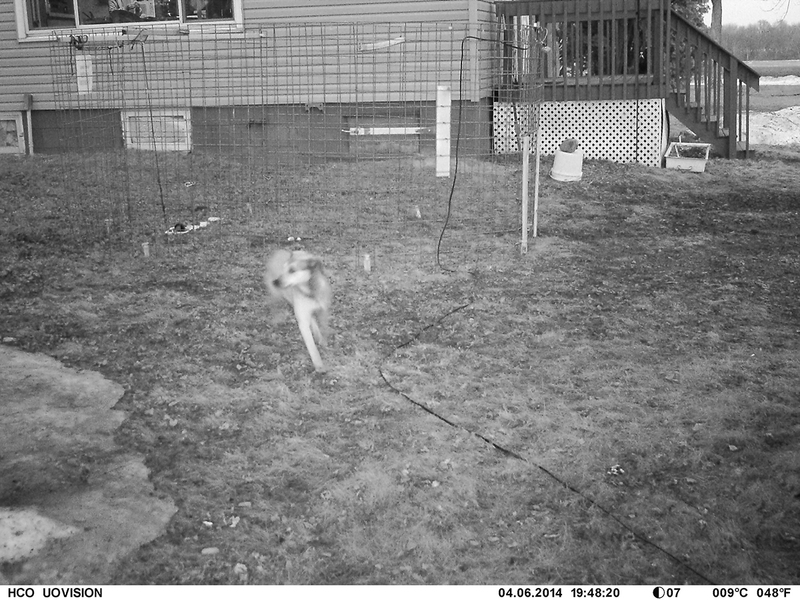 For two weeks, the homeowner left food every day in the same location in his backyard, and soon Samuel was making the trip to the feeding station a couple times a day, often around 3 p.m.
Habituating Samuel to the feeding station was key, because now we were able to deploy the Missy Trap where we expected he would be. We set up the trap on a Saturday morning. 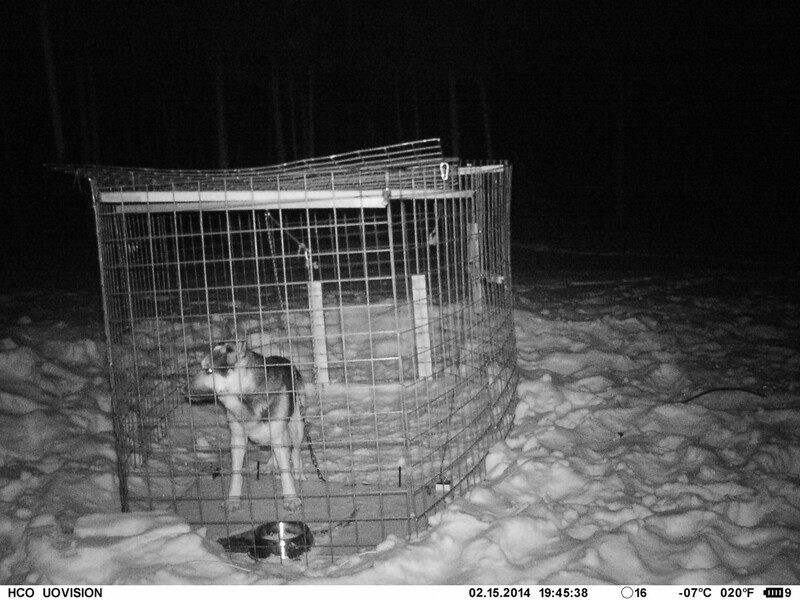 According to photos from the trail camera, Samuel visited the trap several times that day. We decided to lock the gate open for the first day to allow Samuel to get used to the trap’s presence and be comfortable going inside. 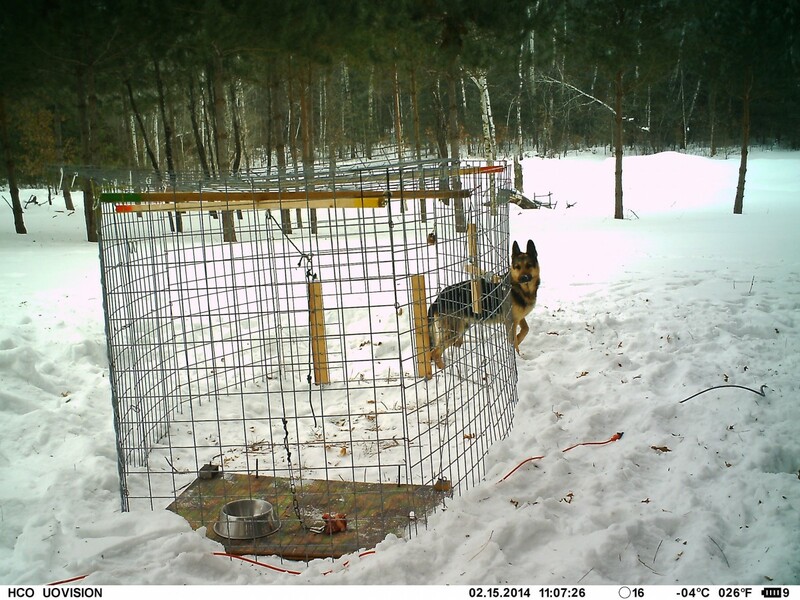 We learned from the trail cam that he went inside the trap each time he stopped by. The following day, February 6, we set the trap door to trigger using an electromagnetic release. Retrievers volunteer Greg James and Samuel’s foster observed from a vehicle parked 200 feet away, waiting for Samuel to make his appearance. At 3 o’clock, right on schedule, Samuel walked out of the woods and slowly approached the trap. Enticed by the fresh food at the back of the trap, he walked fully inside. Greg cut the power to the electromagnet, triggering the gate to fall closed. After 70 long days on his own in the harsh Minnesota winter—which had included stretches of subzero weather caused by a polar vortex—Samuel was finally captured and was returned to his foster home. He had lost 30 pounds but was otherwise in good health—a true testament to the resilience of these dogs when they are on their own. As of this writing, Samuel is safe, warm and doing well in his foster home. We were informed by Dave and Sheryl in Stacy, MN that a black dog had appeared from no where and had been hanging out in their yard for 5-6 weeks. It was cold and she appeared to become great friends with the neighbor’s horse and was sleeping in the horse barn. After doing some asking around, they found out the dog was a foster dog from their neighbor down the road and she had gotten loose. Dave and Sheryl started feeding her outside their sliding door and she got into the routine of feeding from that location when she’d see them step out to fill the bowl and hear them whistle. Often she was seen in their back yard playing in the snow with milk cartons or other things she found. Dave and Sheryl were concerned that the impending polar vortex would make it tough for her to survive and they contacted us to see if we could help trap her into safety and warmth. I drove up with a Missy Trap on the morning of January 4th and we set up the trap in the location right outside their sliding glass door. I had to laugh because the dog watched me set it up from 50 feet away. The plan was to run a rope into the sliding door and when the dog entered the trap, pull the rope to close the gate on the trap. I entered the trap and she was cautious, but allowed me to carry her into their home to get warm and calm down. She was a bit skittish, but quickly warmed up to Sheryl and Dave. They named her Bella. Dave and Sheryl considered adopting Bella, but after a couple days it was decided that it was best for her to go back to her foster. Bella is now living happily with a family nearby and has taken a great liking to their daughter. Happy and warm ending for Bella. Dave and Sheryl did a great job of keeping Bella safe and fed until she could be captured. We were happy to help capture her and get her warm. 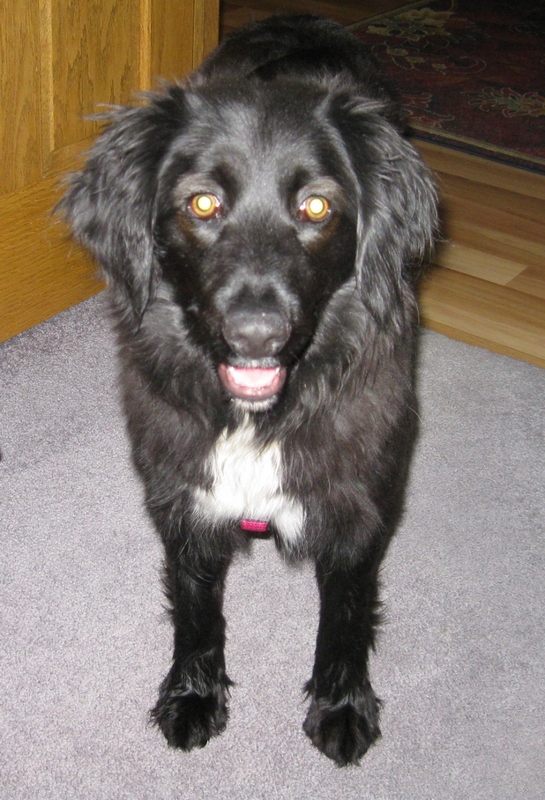 Bella is a young border collie mix and very sweet. We thank Dave and Sheryl for contacting us and for all they did for Bella. Larry is a former puppy mill dog who was rescued through Retrieve a Golden Minnesota(RAGOM). On a warm day in August, Larry escaped his temp foster’s home in rural Annandale, MN, when the resident dog pushed the door open, allowing Larry to bolt through. As members of RAGOM’s Lost Dog Rapid Response team, we were on-site within four hours, setting up the Missy Trap at the point of flight and placing yard signs at key intersections. The next day, a robocall with a lost-dog alert reached 750 neighbors within a five-mile radius. After three days without a sighting, Larry was spotted on the temp foster’s property. 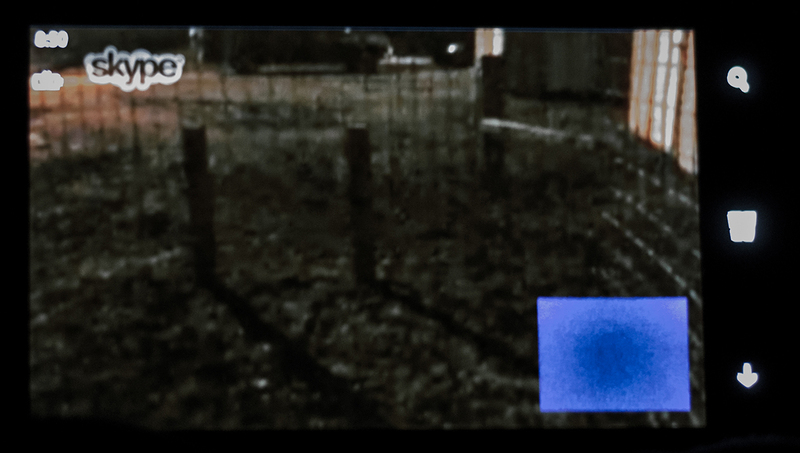 It was information from an animal communicator that spurred a second sighting and allowed us to place the trap at locations where Larry was likely to be. Velvet, a shy, pretty Great Dane, newly adopted through Upper Midwest Great Dane Rescue, panicked and ran from her adoptive home in Eagan, Minnesota and into the suburban surroundings. The area’s wooded parks, recreational areas and quiet residential streets offered Velvet many places to hide. 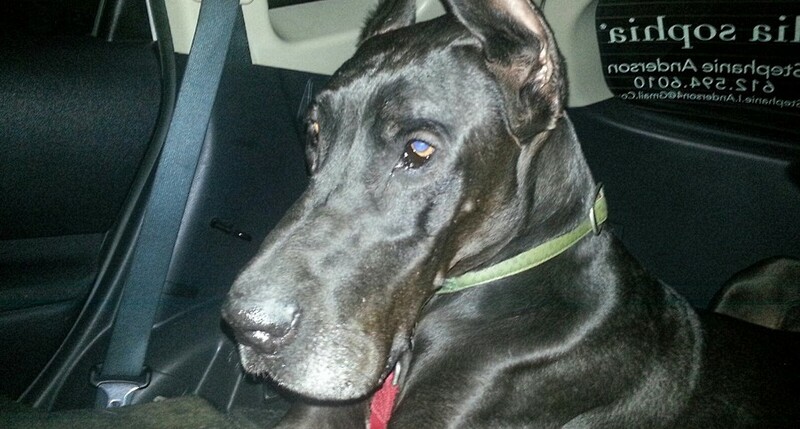 Still, it’s hard not to notice a loose Great Dane, and the rescue received many sighting calls over the next few days, indicating that she remained in the general area. Because the rescue could not find a live trap big enough to capture a Great Dane, they contacted RAGOM’s Lost Dog Rapid Response team to see if we could help. 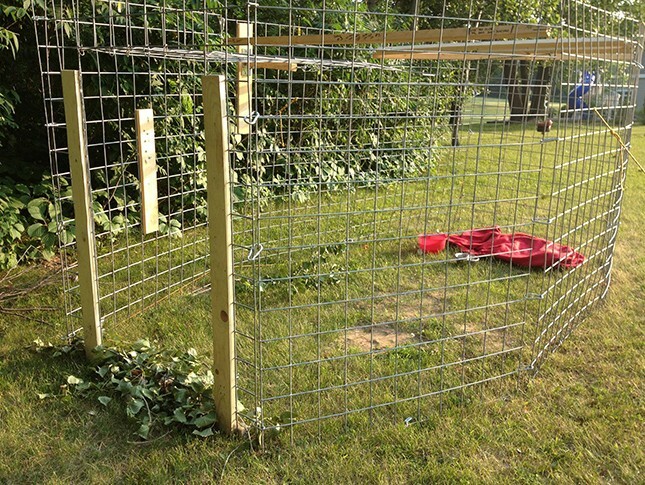 Our engineer built a new door panel for the Missy Trap with a specially modified taller gate. By piecing together a pattern of sightings, we determined a likely route that Velvet had been taking and set up the trap in her path. When she failed to show up the first night, we moved it half a block, which did the trick. 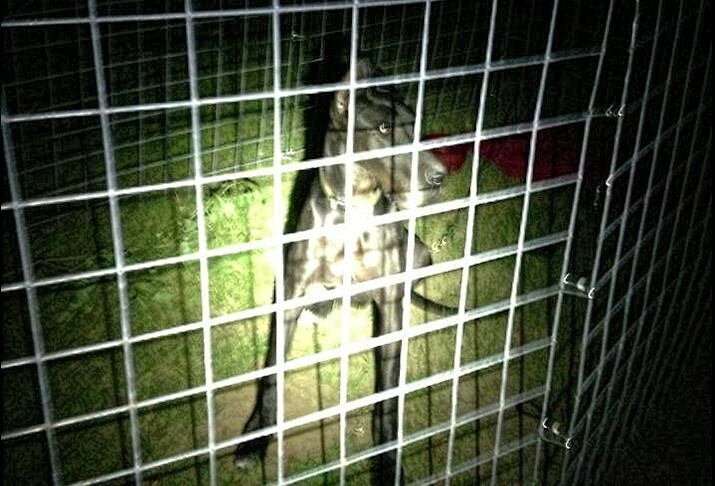 Velvet was captured the next night after eight days on the run.